Animal Defenders International (ADI) has welcomed the decision by DEFRA to refuse big cat circus trainer Thomas Chipperfield a licence to perform in England. The decision was upheld by North Staffordshire Magistrates Court following an appeal by Mr Chipperfield. Thomas Chipperfield has been off the road for more than two years, after withdrawing his first circus licence application after a DEFRA inspection found his animals’ accommodation to be not of a sufficient size. A tour of Wales in 2015, where regulations do not apply, sparked a public outcry and political opposition. ADI has time and again exposed the miserable lives of Chipperfield’s two lions and now one tiger. 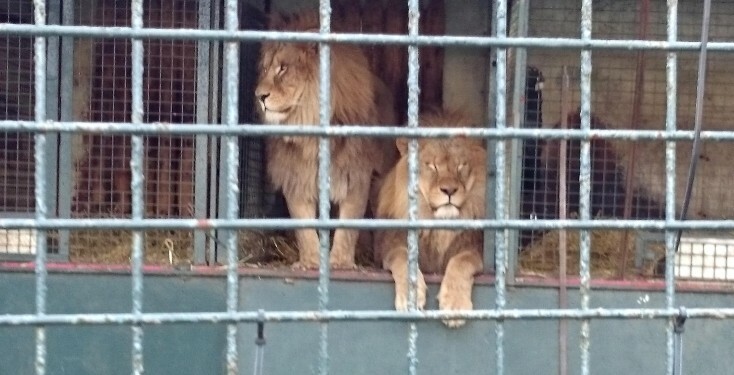 The big cats are confined to cages on the back of a truck with restricted access to an exercise area. ADI footage has shown the animals displaying abnormal behaviour, indicating that they are not coping with their environment. The announcement in February that the UK Government would ban wild animal acts in England by January 2020 follows a decade of promises and more than 20 years of investigations and campaigning by ADI. Repeated efforts by backbench MPs to bring in a ban through Private Member’s Bills, supported by ADI, have been thwarted by just a few MPs; the latest from Conservative MP Trudy Harrison will have its second reading on Friday 27 April. A private members’ bill to progress the ban in England will have its second reading on Friday 27 April. Please urge your MP to support today! Join the global campaign to stop circus suffering! Animals have souls too. This must end now. Freedom to all circus animals!